On Thursday, July 10, 2014 at 3:55 pm local time in French Guiana, Arianespace successfully performed its second launch for O3b Networks, following the successful launch of the operator's first four satellites last year. 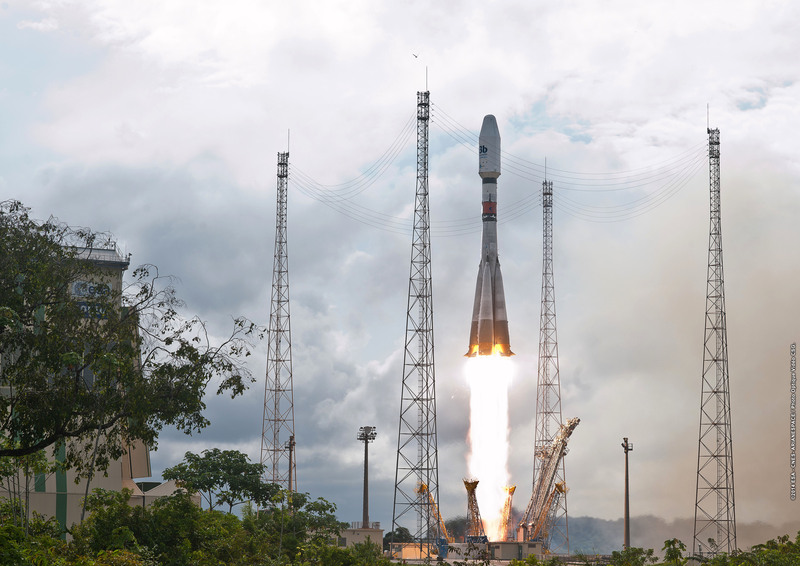 With this eighth Soyuz launch from the Guiana Space Center, all successful, Arianespace proves its long-term support for new operators and helps reduce the world's digital divide. Arianespace lofted four more satellites in the O3b constellation (the “Other 3 billion”) into an equatorial orbit. Built by Thales Alenia Space as prime contractor, these four satellites will enable O3b Networks to supply broadband Internet access at moderate prices to emerging markets in Asia, Africa, Latin America, Australia and the Middle East, totaling nearly 150 countries surrounding the equator where broadband access is rarely available. Following this launch, the O3b constellation will be deployed in its initial configuration and will be fully operational. Arianespace’s partnership with O3b clearly reflects one of the company’s basic values, namely making the benefits of space available to people on Earth. Arianespace has long supported new operators as they enter the market, by providing services tailored to their specific requirements, backed by launch systems renowned for their reliability and availability. For O3b Networks, Arianespace and partners developed a special technique to deploy these satellites into equatorial orbit, combining a dedicated multiple launch configuration and an optimized launch campaign. Furthermore, access to an export credit arrangement facilitated project financing. Arianespace is already gearing up for a third O3b launch, scheduled for the first quarter of 2015. With the Ariane 5, Soyuz and Vega launchers fully operational at the Guiana Space Center in French Guiana, Arianespace is the only launch services company in the world capable of launching all payloads into all orbits, from the smallest spacecraft to the largest geostationary satellites, as well as satellite clusters for constellations and cargo missions to the International Space Station. Arianespace continues to set the standard in launch services for all operators, and guarantee independent access to space. Shortly after the official announcement of the orbital injection of the four O3b satellites, Stéphane Israël, Chairman and CEO of Arianespace, said: “We are very proud of our role in this outstanding project, which will reduce the digital divide by supplying broadband Internet access to populations in equatorial regions. I would like to thank O3b, a key customer for Arianespace, for continuing to place their trust in us for the second phase of constellation deployment, which transforms their innovative vision into a reality. I would also like to congratulate Thales Alenia Space for the timely availability of the satellites, and our Russian partners for the unmatched reliability of the Soyuz launcher. The satellite constellation operated by O3b Networks Limited is injected into equatorial orbit, and will provide broadband Internet access to emerging markets in Asia, Africa, Latin America, the Pacific and the Middle East, totaling nearly 150 countries. O3b Networks will provide telecom operators with trunking capacity and connectivity for mobile networks at rates and response times equal to fiber-optic networks. Placed in an equatorial orbit at an altitude of 8,062 km, these Ka-band satellites will offer low-cost, high-speed telecommunications and Internet access to the “other 3 billion” people on our planet who do not yet enjoy broadband access. The satellites in the O3b constellation, each weighing about 700 kg at launch, were designed, tested and integrated by Thales Alenia Space. As of July 9 2014, 217 Ariane launches, 33 Soyuz launches (7 at the Guiana Space Centre and 26 at Baikonur with Starsem) and three Vega launches have been performed. The company’s headquarters is in Evry, near Paris, and has local offices in Washington DC (United States), Tokyo (Japan) and Singapore.